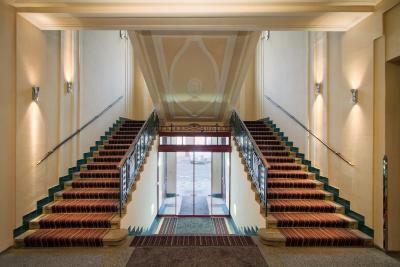 Lock in a great price for Theatrino Hotel – rated 8.6 by recent guests! 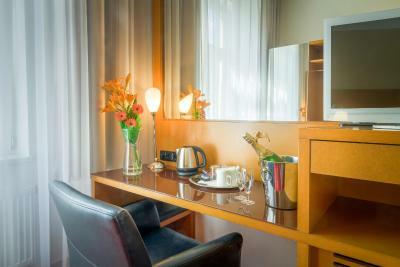 Nice hotel, good location, it is near a large park, great breakfast. We had a great stay with this hotel. David and the other reception staff was very helpful. They give us good tips on where to go. 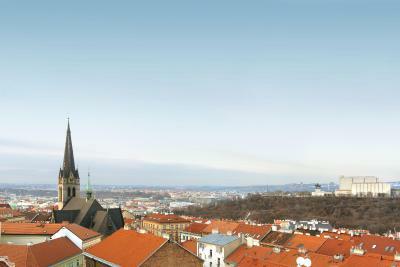 We enjoy the Prague tour that David recommend to us. 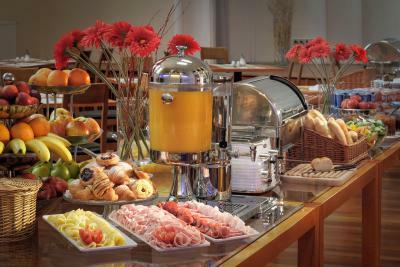 We also like the generous breakfast and charming Tatjana at the dining area that make us feel at home. Overall, we had an awesome weekend with the help of Theatrino Staff. I was staying in one of the rooms with my wife for two nights. The room was clean and the view from the window was amazing. Breakfasts in the hotel are of the highest level. 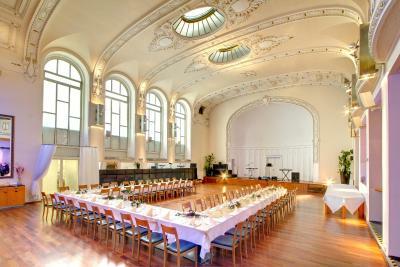 The food is good pretty standard, but the decoration of the room for breakfast is extremely beautiful: aka you are eating in the hall of the theater (probably that was a concert hall in the past). Excellent breakfast. Nice and helpful staff. Great location and price. Exceptional value for money, one of the best breakfast I ever had, nice area. Cool, beautiful facilities. 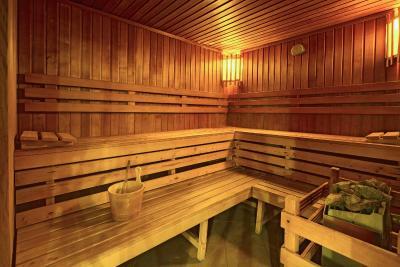 Great hour in the sauna. Fun bar. Great, generous breakfast. 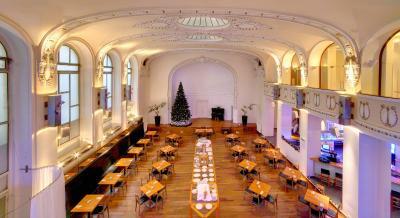 Loved eating in the old theater. Nice staff. 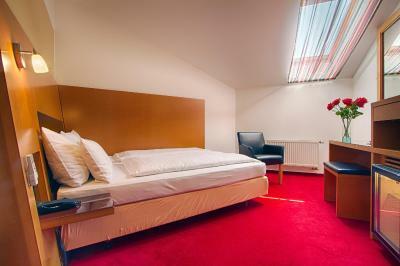 Cleanliness, comfortable bed, nice staff and great breakfast. Comfy and quiet place to stay. A tram ride just down the street. Perfect for sightseeing. Theatrino Hotel This rating is a reflection of how the property compares to the industry standard when it comes to price, facilities and services available. It's based on a self-evaluation by the property. Use this rating to help choose your stay! 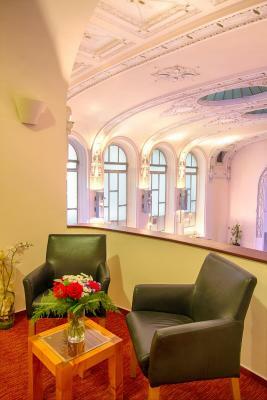 Hotel Theatrino with free Wi-Fi and is located in the quarter of Zizkov in central Prague, with its many fashionable restaurants, bars and the TV tower with an observation deck 305 feet high. Famous Wenceslas Square is only 4 tram stops away. 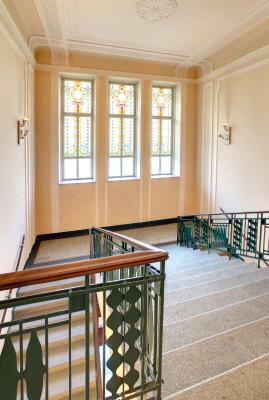 Modern design combined with Prague’s unique Art Nouveau style gives the listed building its special artistic flair. 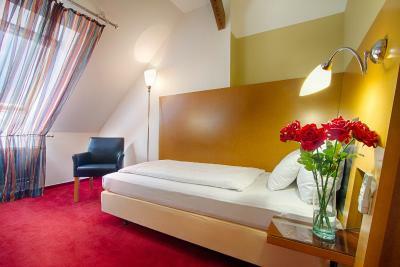 Each guest room in the Theatrino is individually and very tastefully designed. 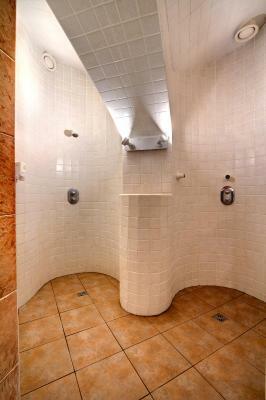 Guests can enjoy a spa center, including the steam bath and sauna for an extra surcharge. 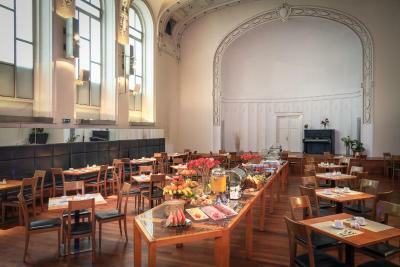 Enjoy the breakfast buffet in the fine ambiance of a former theater hall in Art Nouveau style, renovated by Austrian architect Harald Schreiber. 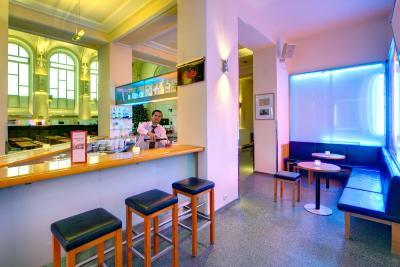 Theatrino Hotel is only 3 stops by tram or a 20-minute walk from the historical city center. The Lipanska tram stop is only 150 feet away from the hotel. You can take a nice walk in the picturesque Riegrovy sady (park) and enjoy superb views of the city from the TV tower. A 3D cinema can be found close by as well. 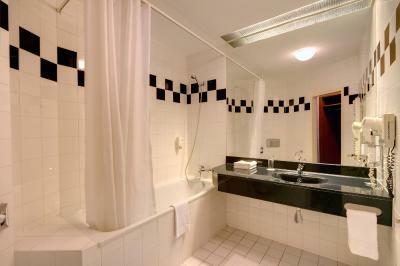 The hotel can organize sightseeing tours and excursions. 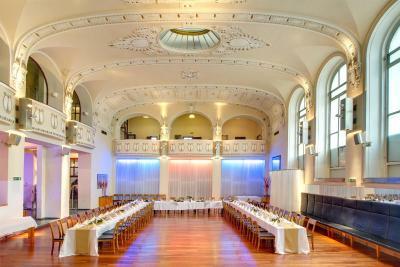 When would you like to stay at Theatrino Hotel? This room has a flat-screen cable TV, a minibar, free coffee and tea-making facilities, a safe and a private bathroom with a shower or a bathtub. 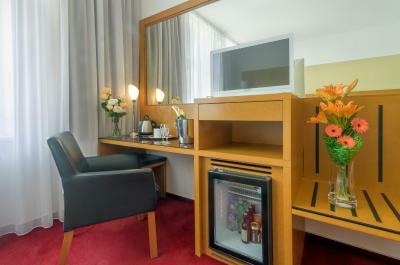 This room has design furniture, a bathroom with a shower or a bathtub, toiletries, a mini-bar, cable and Pay TV. 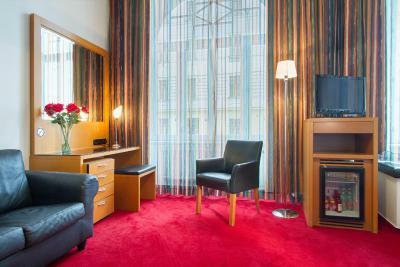 There is a hairdryer, a safe deposit and free coffee and tea making facilities. This room includes a flat-screen cable TV, a minibar, free coffee and tea-making facilities, a safe and a private bathroom with a shower or a bathtub. 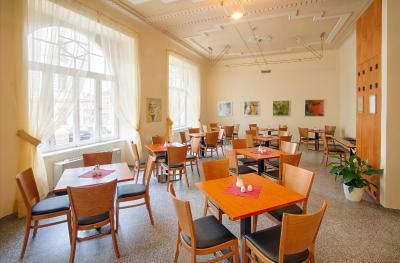 It features design furniture. 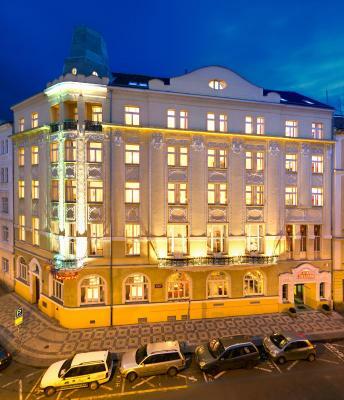 Design hotel Theatrino is located in the city centre, in a quiet residential area of Prague. 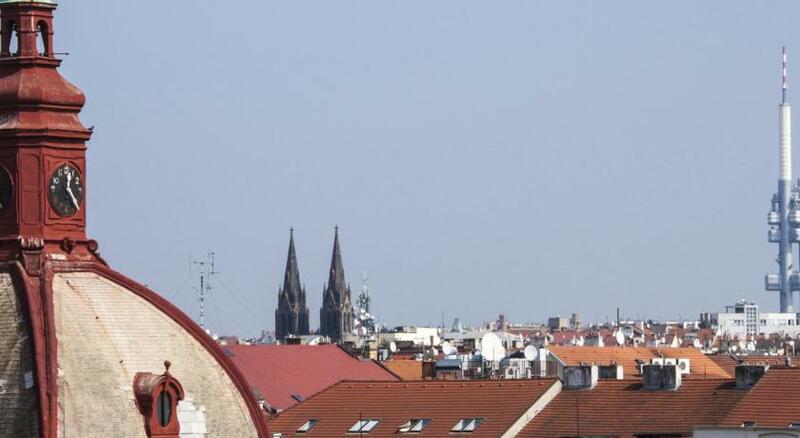 The historical centre of Prague can be reached easily by public transportation or on foot. 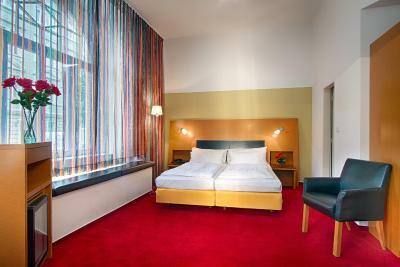 There is a tram station only 1 minutes away from the hotel and to reach the nearest metro station is a ten-minute walk. In the vicinity of the hotel you will find a number of shops and restaurants, fashionable shopping mall Flora as well as the New Žižkov Cemetery, where Franz Kafka, the world-famous writer, is buried. Don’t miss the unique view of Prague from the near Žižkov TV tower either from its restaurant (66 m) or the observation deck (93m). House Rules Theatrino Hotel takes special requests – add in the next step! Theatrino Hotel accepts these cards and reserves the right to temporarily hold an amount prior to arrival. Good place with helpful and nice stuff. Clean and comfortable. Good breakfast. Special thanks to Tatjana for the hospitality. If you have time, the walk to the old town is about 30 minutes. If not, the tram station is just around the corner. 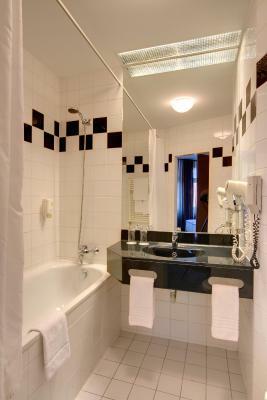 Bathroom had foul smell of drainage so after complain they moved us into other room but it was OK. Breakfast was fine. Rooms were nice and big and location was fine. Tram was only 2mins walk. Staff were very helpful. Everything was good. Surprisingly good internet connection. Nice staff, ok breakfast buffet. The hotel is close to public transport, but on a quiet street. Mattress was a bit too soft for us. Very good breakfast, rich. It was very clean. We had a very spacious room. Rooms could do with a refresh, but sparkling clean and our room was massive. The booking was done for my parents who came back really happy from the trip. They were very happy with the fact that Hotel could arrange for them things like currency exchange, local transportation tickets and sight seeing tours. The location being near a tram station also helped. The breakfast was good considering my parents are vegetarians. The breakfast wasn't remarkable. Cheap coffee and food! 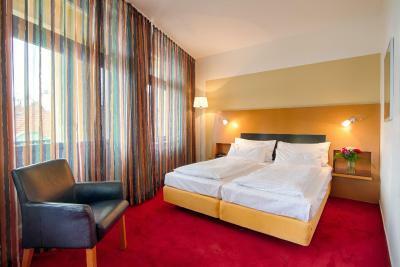 The room has a nice athmosphere, the bed was comfortable! Minor suggestions for improvement. An ironing board and iron in the room would be handy. At breakfast it would be nice if someone went around serving real coffee and/or an espresso machine. The breakfast was great. A wide range of options and good orange juice. 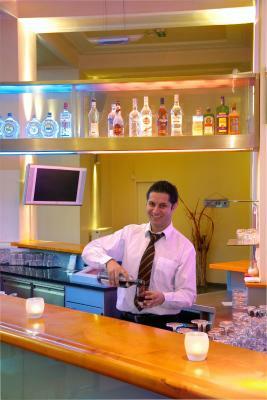 The staff are very friendly and will go out of their way to help if there is any issue. Everything! Fabulous, helpful and friendly staff, amazing bar, very comfy beds, great shower! 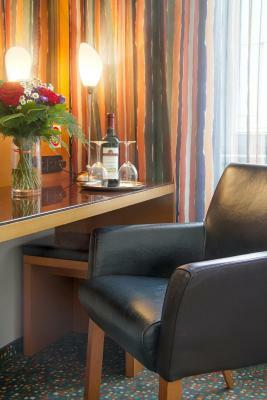 Should the urge take you to partake of the minibar, is very reasonably priced. I had a room with a fabulous view! Needs a bit of renovation. Walls in the rooms not clean enough.. tv remote dirty.